I have to admit right from the start that metal has never been my medium of choice; I prefer trem-bar bends in short bursts, not big bombs, and I like distortion to sound like distortion, not explosions. That said, I’ll also admit that there are few things that can get my blood circulating faster than bashing barre chords on a really nice neck through a very decked amp. 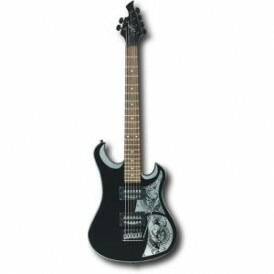 On that count, it’s easy to see why Ibanez has maintained its top standing on the hard-rock planet for decades now. And while its reputation among the global metalhead population is enough to keep the business model afloat indefinitely, the company continues to craft new permutations of its legacy models in an effort to reach those of us who don’t regularly hold digits one and four aloft. Which brings us to this year’s new arrival—the Premium RG Series, a set of sleek, hardbody models that notes lbanez, are designed specifically “for hardworking musicians”—i.e., those who seek a guitar with professional-level playability that can also hold up to extreme performance punishment, day in and day out. The latest extension of the nearly 30-year-old RG (originally for “Roadster Guitar”) family, the Premium is outfitted with many of the trimmings found on the top-tier Prestige line but is priced closer to the value Standard series. And with its locking tremolo and low-profile 24-fret neck, the Premium is a solidbody that easily supports both speed and strength. 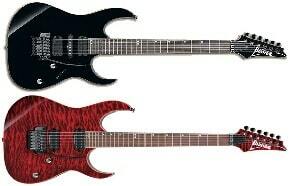 The Premium series comes in two flavors: the RG870 has an American basswood body and includes a trio of Ibanez CAP-VM pickups; and the higher-end RG920QM, sporting a quilted maple top on an American basswood body and outfitted with trusty high-gain DiMarzio IBZ pickups in the bridge and neck positions, as well as a newly augmented Edge-Zero II bridge with Zero Point system. The RG870 comes in simple, classic black; the RG920QM has a translucent finish over colors that include black ice, cobalt blue surge, high voltage violet, liquid inferno, and red desert. Whether you dive-bomb or just bend a little, the new, improved Edge-Zero II tremolo system with ZPS3 ensures that you’ll be able to hold it together bend after bend. Don’t worry about losing your grip mid solo either. A specially designed socket holds the arm in a fixed position while providing proper torque at all times. And if you want more swing, simply loosen the socket or you can even remove it altogether. The guitar’s Edge-Zero II bridge with zero-point tuning mechanism keeps string slips at bay, even under the most grueling of playing situations. And the guitar’s set of solid, secure string saddles ensures proper intonation and maximum string vibration; individual string height can be easily adjusted. Getting around is no problem either thanks to the RG920’s supple Wizard Premium 5-piece maple / walnut neck, which includes a bound rosewood fret board, offset pearl dot inlays, and set of 24 Premium edged jumbo frets with rounded edges for smoother playability and secure neck grip. Similar in style and construction to the pricier Prestige Wizard series, the Wizard Premium neck is cut for extra comfort (18mm thickness at the first fret, up to 20mm at the 12th). A titanium neck-reinforcement system provides extra stability and improved intonation as well. While metal maybe the most likely by-product of a sleek-neck lbanez with tightly wound humbuckers, when connected to a few unusual amp combos, the RG920 revealed some interesting nuances. Plugged straight into my favorite studio oldie, a ‘50s Gibson GA-40 combo tube amp with Class A circuitry, the RG920 and its pair of high-gain DiMarzio IBZ pickups (similar to those found on the Prestige) offered exceptionally large rhythm-guitar bass tone that would be right at home in a pure pop setting. And with a signal chain that included a basic tube overdrive at the front and a Leslie Model 760 rotating speaker system at the back, the RG920 sounded strikingly similar to Blind Faith-era Clapton with smooth-sounding distortion that could be easily controlled by slightly rolling off the guitar’s bridge-position volume control. But in straight-out metal settings, driven through an ‘80s Marshall JCM 800, the RG870 and RG920 come into their own: singing sustain for days and bolstered effortless playability from the first fret to the 17th and beyond. You can just feel yourself getting faster and more fluid the more time you spend working with the Premiums. Whether you play strictly metal or a variety of genres, I can say with assurance that the Ibanez Premium RG920QM—as well as its “workhorse” mate, the RG870—is anything but a one-trick six-string. Ridiculously rugged and highly musical, these are instruments that have the look and feel of significantly pricier models, and, when plugged into the right amp, are extremely well suited for virtuosic performance in many different playing styles.